If you establish good preventive dental techniques and attend regular checkups and cleanings, it could reduce the likelihood that you will have to get dentures. Sometimes getting them can be an inevitable reality that you have to face if you have a history of tooth problems. Lucky for you, dental advancements have given you multiple denture options that feel and look completely natural. But how do you know if it’s time for you to get dentures? Here’s a list that can help you determine if you need to visit your dentist to discuss your available options. If you have frequent tooth pain that you’ve ignored, it could be a sign of decay that has reached the pulp of your tooth. If you want to enhance your smile and you’re always quick to hide it, they could be for you. If you don’t establish good preventive measures like visiting your dentist semi-annually, it makes your teeth more vulnerable to disease and infection and could result in needing dentures. If you want to replace one or more teeth that you’ve lost to complete your smile, dentures or partial implants could help. If you have a difficult time chewing or eating certain foods, it could be a result of gum disease or tooth decay. If you have loose or shifting teeth, it could be related to bone loss or undiagnosed periodontitis. Your dentures are made to replace a missing tooth or teeth and can be partial or complete. They can also be removable or fixed. What does this all mean though? Complete dentures are made after your teeth have been removed and your gums have started to heal. Typically, you’ll be ready to use these about 10 weeks after your teeth have been removed. On the other hand, partial dentures are meant to replace teeth and are attached to a plastic base resembling your gums. These are used when there’s only one or a few missing teeth. You can also choose from dentures that are removable or implant dentures. Removable dentures are typically cheaper than implants and need to be removed and cleaned daily. Implants are permanent, natural-looking additions that not only reproduce your white crown, but also the roots of your teeth. They help support bone growth and can last a lifetime with regular brushing and flossing. It is important to visit your dentist to discuss your options since you have to meet certain requirements to be fitted for dental implants. First, your dentist may need to remove some of your teeth to get you ready for your dentures. When your gums heal, you’ll be ready for the next step. Second, your dentist will form your dentures by using a mold from an impression of your mouth. They’ll determine the size, color and shape of your teeth from this. 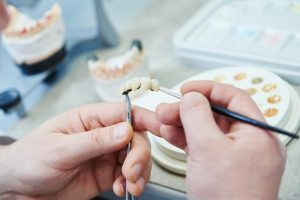 Lastly, once your gums are healed and dentures are made, you will need to try them on and your dentist will check if any adjustments need to be made. For implants, they will place them in your jawbone and install your dentures. It may take a little bit of time to get used to speaking and chewing with your dentures. Your dentist can also offer cleaning and sanitizing tips to help maintain your gum health. Taking the first step to get dentures can be intimidating, but your dentist will help you make the decisions right for you. All it takes is scheduling that first appointment. Dr. Glenn Shtarkman and associate Dr. Caroline Salib share a passion for helping the community of Parma Heights attain their best smiles. Dr. Shtarkman offers over a decade of experience and special focus on implants and cosmetic dentistry. For questions on how to start the process of getting your dentures or implants, visit Advanced Dental Center’s website or contact them at 440-885-5354.